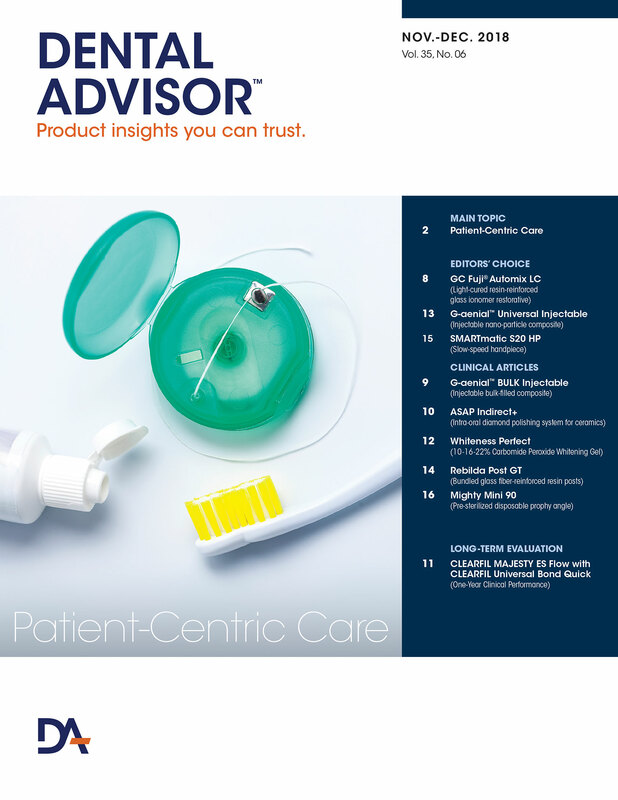 Make sure the dispensing tips are locked into place. Do not use the tip to put pressure on a band or retract tissue because it spins easily. Great for primary teeth, Class V/root caries, build-ups and the sandwich technique. Work fast as the setting time is quick and use conditioner on instruments to aid handling. This product is very light sensitive make sure you use your loupes with the filter. 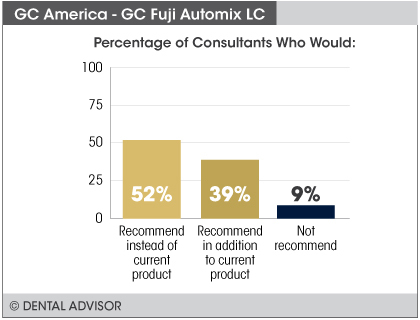 GC Fuji Automix LC was evaluated by 33 consultants, with a total of 490 uses. 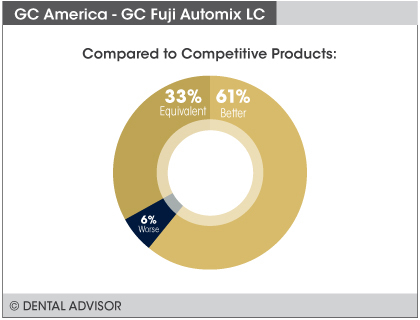 GC Fuji Automix LC is a bioactive, light-cured, radiopaque, resin-reinforced glass ionomer restorative. 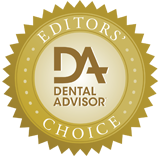 It is moisture tolerant, self-adheres to enamel and dentin, offers excellent fluoride release, and recharges with fluoride. It is mixed using GC America’s single-use, disposable automix tips that mix the material as it is extruded, which can then be and then dispensed from the automix tip to the site with an ergonomic dispenser. 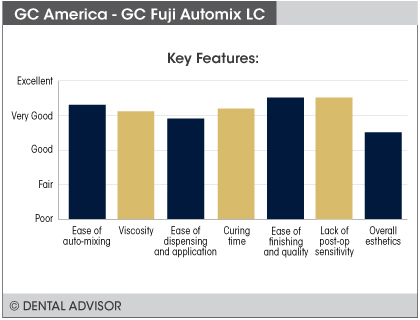 After curing, restorations placed using GC Fuji Automix LC can be immediately finished and offers good esthetics. For improved adhesion, the surface can be prepared by conditioning it with GC Cavity Conditioner. 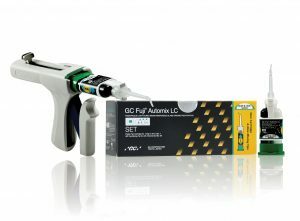 GC Fuji Automix LC is available in a starter kit containing GC Fuji Automix LC cartridge shade A2, Paste-pak dispensing gun, 20 Intraoral mixing tips, and one 6 g bottle of Cavity Conditioner. The material is available in three shades – A1, A2 and A3.